The new Gold Standard transducer from Micro Direct gives you the most precise volume and flow measurements for your Asthma and COPD patients. Especially effective at low flows, it complies with all current ATS and other recognised international standards for accuracy. This means that Micro Direct’s world beating spirometers are the definitive benchmark for accurate respiratory measurement - bar none. Fast on-screen text entry enabling comments. Child incentive display "Bubble Gum Kid"
Direct connect to external Hewlett Packard printers. 41 test parameters 2000 patient test memory. 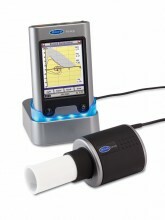 Click the button below to add the Micro Direct MicroLoop Spirometer to your wish list.